We had a great Christmas. I hope you did, too. My mom's picking us up in 20 minutes and taking us to the airport. God bless Curtis Jones for letting us fly to Springfield instead of making the 12 hour (plus 3 more hours for bathroom stops for Pregnant Girl) drive. I'm only a few hours away from meeting my new nephew. Yeah! I'm so glad we're leaving today. It's going to be a record high of 80. Y'all, we are a week away from January. That ain't a bit right. I'm offline for the next week. That is, unless we go over to cousin Erin's house and in my desperate state I hijack her computer. See you January 1, 2009! This has already been such a neat Christmas. First of all, Jackson is at a great age. He's old enough to understand somewhat, but he doesn't remember last year and isn't obsessed with getting presents tomorrow. But I told Curt that this will be the last year that we're not woken up at 6 a.m. by an excited child coming down the stairs! Although when that happens next year it will be a whole lot of fun, too. Second, being in a new house in a new-old city, we've gotten to lay a foundation for our family traditions for years to come. It's been so fun. And I don't feel like we've put a ton of pressure on ourselves to make everything super spiritual or "magical." 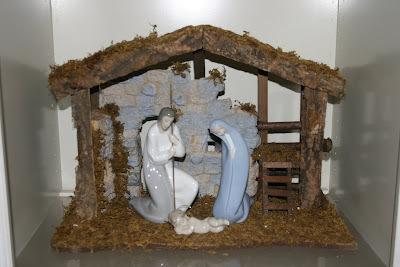 Christmas is already those things if you set your heart on Christ every day. We've enjoyed lots of freedom in that area, if that makes any sense. Last year I felt a lot of guilt about everything cool and deep that so-and-so was doing that we weren't, but I did not pick it back up this year. I just want us to be who we are as a family and who we are in Christ. I don't want to pressure us to get on somebody else's bandwagon or play the comparison game in my mind. Wow, how did I get talking about this? Moving on now! Third, it's really special to be great with child at Christmas. Thinking about the birth of Christ comes pretty naturally when you've got a little one kicking around in there all the time. Fourth, this is the first time since our very first married Christmas to wake up in our own home on Christmas morning. We will set out for Missouri on Friday, but it's been nice (and very unusual) not to be traveling all over the place this year. (I think I feel an extra measure of calm because we didn't just travel for Thanksgiving.) This December we were not as busy as in years past, probably because Curt is no longer on a church staff. Ministers are busy, busy, busy during the holidays with all the church Christmas parties and services they have to run and attend. It's fun but the calendar fills up fast! Tonight we started what might be a new tradition for us. I hope it is because it was so much fun. We went to my parents' house for dinner. Melissa and my mom had been cooking and baking all afternoon and we had all sorts of treats. Colin and Mom made us Reuben sandwiches on the skillet. It turns out Colin worked at Jason's Deli when he was a teenager and he has mad skillz at sandwich making. I ate mine without the sauerkraut (that stuff is just sick) and it was great. My mom's dad used to make these sandwiches at Christmastime and she was really missing it. We had the best time sitting around the table and visiting. My dad gave me back my camera bag tonight and I thought it felt a lot heavier than normal. When I opened it I saw that he had left his super duper lens on it. Not knowing how to take it off myself, I took the camera bag to him and said, "Daddy, you left your lens on there." Then he told me that, no, that wasn't his lens. That was my new lens! He had just bought it for me today! Along with a new battery! I could not believe it. What a sweet surprise! I've been trying it out tonight and I think it's going to be really great to have. Thanks, Daddy! What great timing with Christmas tomorrow and the baby coming soon. I told you he was the most generous person ever. We came home and put The Sir to bed quickly. Mom and Dad Elf had lots to do! Curt had to put together this awesome race track that Jackson is going to flip out over. I know this because his friend Nathan has one and he went nuts over it when he got to play with it. We got out the video camera which, shamefully, hasn't been used since last Christmas. We watched the footage of when he got his bounce house and it was so cute. He wasn't talking a lot then, but he squealed so loud. Oh my gosh, I love that boy. I hope you all have a fabulous Christmas with your loved ones tomorrow. And if you don't have your loved ones, you have the unique chance to focus on the Savior in a huge way. Not that it wouldn't be hard, but I bet it would be one of those things that would be very sweet to look back on later. (Angela in Romania! We love you, sister!) I pray each of you can feel the nearness of Christ tomorrow. She said it so well. Someone needs to come up with a blog tool that will title your posts for you. Wouldn't that be brilliant? Our Christmas party yesterday was great fun. Everyone caught onto bunco quickly and it was very loud and obnoxious, as it should be. Mom had gone to Target and bought all the prizes for us. In the LPM version, everyone gets a prize for something. Mom was apparently attempting to purchase all the "As Seen on TV" products available at Target. 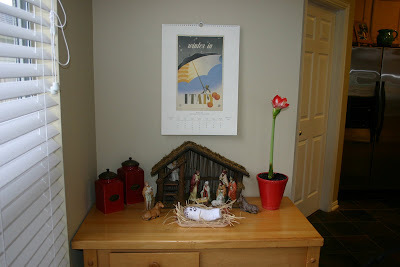 My favorites were the Ped Egg that Nancy won and the microwave pasta maker earned by Susan (who's like a gourmet cook). Curtis wasn't there, but he won a quesadilla maker in absentia. We were totally pumped about that. My secret Santa gift came from Sabrina and it was a beautiful glass tea pot, tea bags, and butter cookies. I've always wanted a tea pot like that and I can't wait to use it. I might have to find a reason to splurge on a flowering tea for my pretty pot. My secret Santa gift went to Jenn and I gave her a set of Bath and Body Works' lavender chamomile stuff. My favorite! I don't have any pictures of our party or carriage ride and will be low on any other pics for a couple of days. My dad needed to borrow my camera to take pictures of some very rare deer on the ranch. Since he was the one who gave me the (very nice and too expensive for the Jones budget) camera and all, I thought it best not to think about all the important events I needed to capture this week and just hand it over happily. My dad is the most generous person I know. So I've had my mom's camera but I haven't really been using it. Blah, blah, blah. How long will this rambling go on? By bedtime I was pretty sure I was coming down with a cold. By this morning I was more than pretty sure. I would absolutely love to crawl back in bed and be fed chicken soup by someone who loves me a lot. Today I have another OB appointment. I think I'm about to start going every 2 weeks. We'll see. I'm now 32 weeks and 5 days, which means I'm 8 months pregnant. Holy cow! (FYI, you are actually 10 months pregnant on your due date.) I'm not good at math, but I think I'm 51 days out from my due date. I'm getting so excited. Right now I'm not as much feeling desperate to be done with the pregnancy as I am desperate to meet and hold my little girl. But I've had several friends who have had preemies and I'm definitely not wishing she would come early. In other news, Mel's mom went home to be with Jesus yesterday. 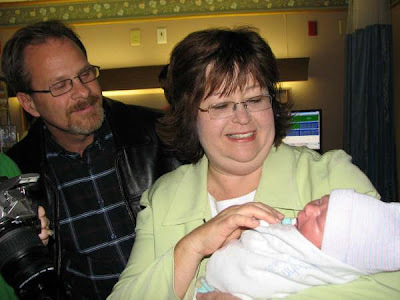 It had been a week-and-a-half-long roller coaster ride for her and her sweet daddy. I know they're thankful that she's not still laying in that room in ICU, but now they'll face the painful reality of daily life without mom. The viewing is set for Friday and the funeral for Saturday. Her husband's grandmother has also just passed away, so they are really going through it. Thank you for praying for my dear friend. Finally, Jamie and her family are going to be hosting a little girl from Haiti who is flying to Austin, TX, for a much needed surgery that has been donated by some doctors. 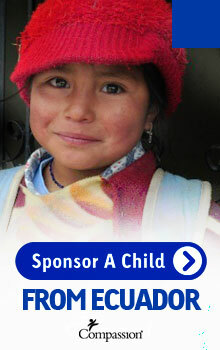 They're trying to raise some funds for her plane ticket. If you have some cash burning a hole in your pocket or want to pray for them, check out this post on Jamie's blog. Blessings on you and yours today! 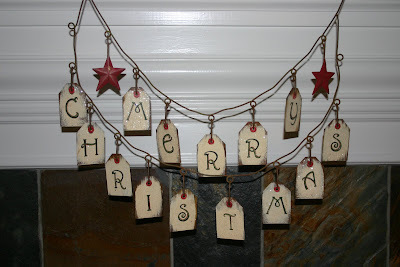 In about an hour I will go to the LPM office for our annual Christmas party. Yeah! We look forward to the madness every year. There are 14 of us now, I think. Just having everyone together is a blast. These women know how to work hard and how to play hard. We are playing bunco for our party today. I can't wait. We did this several years ago and it was a big hit. Then we'll also do a secret Santa gift exchange and have lunch together. Melissa and Colin arrived on Saturday evening. My joy is complete! It's so good to have them both home. Have I ever told y'all before how wonderful my bro-in-law is? He is such a good hubby to my sister. Saturday night we went on a carriage ride looking at lights. What a neat memory we made. It was right before a cold front came through though and it was HOT. Curtis was taking off his cap and wiping his brow, I'm pretty sure Jackson had dew in his hair, and my hair looked like I had blown it dry without brushing it. It was BIG. We had fun though. Sunday held a very neat surprise. Shane and Shane had been at our church doing a Christmas concert Saturday night. We weren't able to go because I had stupidly scheduled the carriage ride for the same time. I was so bummed. But they led worship for us on Sunday morning! If anyone saw me and Melissa high-five each other, that's why. 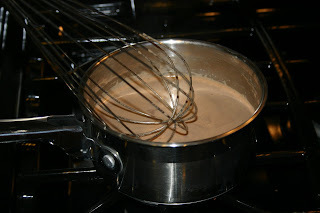 Okay, now I am going to re-post my "Baking Day" blog entry over at LPM. Sorry for those of you who will see it again. Please don't feel compelled to comment again over there. Have a great Monday! This was the scene in my kitchen this morning. It was baking day. Think it looks bad? You should have seen me. I had fourth day hair. Jackson looked a little homeless too. Pillsbury wanted to bless my little heart this year and provide my HEB with huge tubes of refrigerated gingerbread dough. Someone give Him some praise. I'm the worst baker of all time and this was even easy enough for me to use. 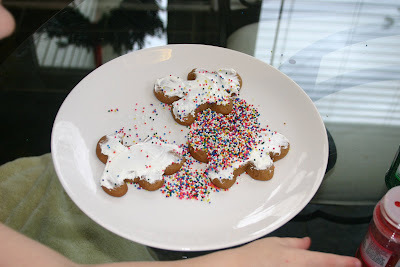 So Jacks and I made some little gingerbread men together. 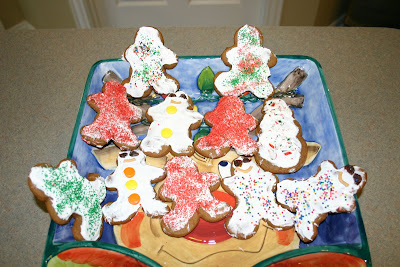 Here they are, iced and ready to be sprinkled. Oops, Mommy didn't realize that the Mister wouldn't know how to shake the bottle. 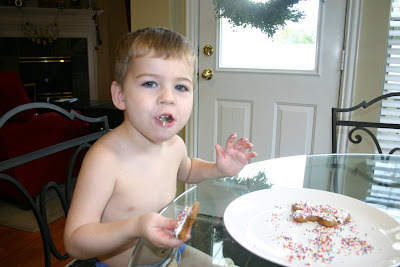 He just turned it upside down over the one cookie and let the sprinkles pour out. Why I was not hovering over him at that moment baffles me. I was watching from several feet away as half the bottle landed on one little cookie. Also? Those little round ball sprinkles? They roll off the table and bounce all around the kitchen. Then they stick to your feet and travel onto other surfaces. Like rugs. Bad, bad sprinkles. Trying to redistribute them a little. 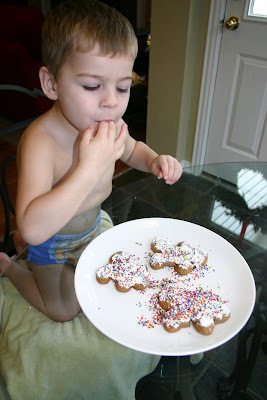 Who needs a napkin when it comes to sprinkles and icing? Our cookies got the Jackson Jones stamp of approval. 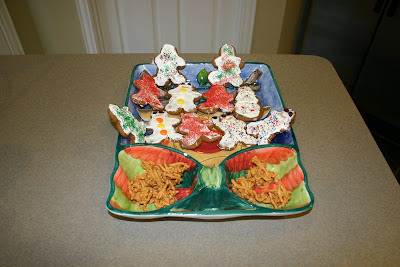 The fruit of our labor - gingerbread men and butterscotch haystacks. A closer look at our cookies. Not the cutest ever, but they taste so good! 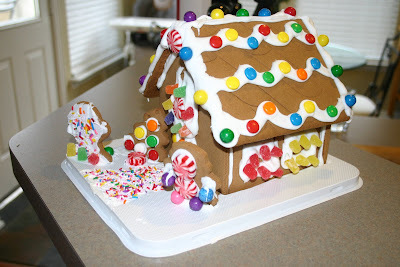 This is the lovely gingerbread house I bought in early November for Jackson and me to make together. I never could get up the nerve to attempt this project with him though. Somehow I just knew it would be too much for Pregnant Girl and Toddler Boy. So I made it by myself a couple nights ago. Jackson was thrilled when he saw it. Although it has been torturous for him not to be able to eat the candy. 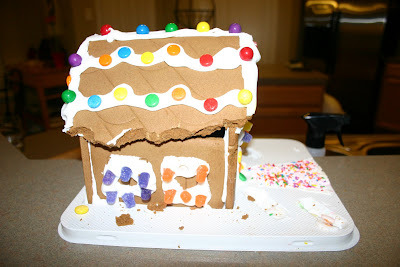 Thankfully, I had enough foresight to save him a few of the gumdrops and Spree. 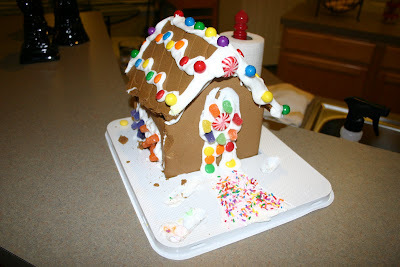 This is what our gingerbread house looked like when we got home from Second Baptist's "Kids' Crazy Christmas" show tonight. Hmmm, had there been a tornado in my home? 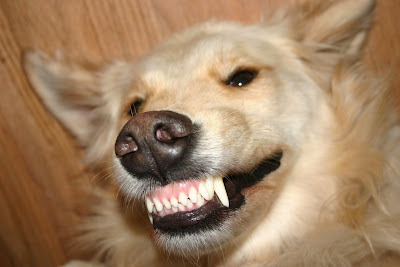 Would anyone like a naughty golden retriever for Christmas? Come on, it will get you in the mood to see "Marley and Me" on Christmas day! I knew better than to leave that tray of cookies out on the counter, so I hid it in the oven when we left. I never would have guessed that Jughead the Big Dumb White Beast would go for the house. Seriously. Who does that? Let me start by saying that you know it's Christmas when the UPS man comes to your door at 8 p.m. So I recently gave in to curiosity and upgraded my free sitemeter to the deluxe version. It has been tremendously entertaining. One nifty little tool it provides is a list of search terms that lead people to your blog. Here are some of my faves from today. Oh, by the way, the package that just came was a smoked turkey. At 11 a.m., Curtis and I headed to Jackson's class for his Christmas party. We quickly realized that our son has one of the biggest personalities/is one of the biggest handfuls in the class. He was the one child who talked continually and didn't hesitate to ask for more cheese, strawberries, nuggets, and cupcakes. Also, he kept telling his teachers that "This cheese is fresh!" and "These strawberries are fresh!" He was so enthusiastic about the freshness of his food that I'm sure the other adults think our kid lives on a diet of Chef Boyardee. I'll have you know that I made vegetable soup with FRESH veggies last night and he would have none of it. After the party, Curtis and I had lunch at the dirtiest, smelliest, grossest restaurant I've been to in ages. Yuck. Then I power shopped at the mall. I seriously bought like 9 presents in the span of an hour. I had a list that I crossed off and everything. It was amazing. Next I headed back to LPM to take some pictures of our Christmas decorations for the other blog. That will get posted tomorrow. While I was there, my mom's dog Star managed to pee on Curtis' sermon notes. I'm thinking maybe the Lord wanted him to go in a different direction? It was finally time to pick up the boy and head home. We spent an hour there and then we headed to Chuck E. Cheese to meet some friends. Jackson had the time of his life, as usual. I feel like I've been awake for two days. I can't wait to go to bed. But I have one last thing to do. There is a small piece of cake sitting on the counter, wrapped with love by my co-workers and sent home to me through Super Hubs. The perfect ending to a long day! My dear friend Becca tagged me for this meme and since I pestered her for 2.5 years to start a blog and she finally did, I will oblige! FYI, Becca is having twin baby boys this winter. Yeah! 8) Sometimes Jackson and I watch Full House while we're eating lunch. 2) So I couldn't sleep. 3) I tossed and turned all night. 4) Then I woke up very tired and grumpy. 5) I got Jackson ready for MDO. 6) But I couldn't find the hiney wipes. 7) So I picked a fight with Curtis. 8) And we just made up over Mexican food. 1) Going back for another 3D ultrasound today. We're getting a free do-over to hopefully get some better pictures of the baby. She wasn't very cooperative last time. 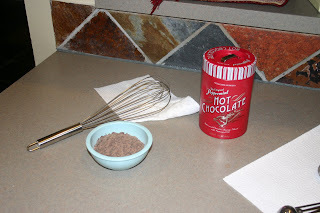 2) Making some hot chocolate later. 3) Jackson and Baby's new furniture getting here. 4) My sister and Colin coming home for Christmas this weekend. 5) Our LPM Christmas party next Monday. 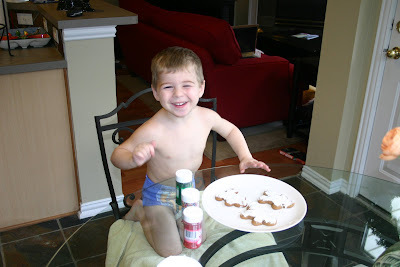 6) Experiencing Christmas morning with Jackson at this age. 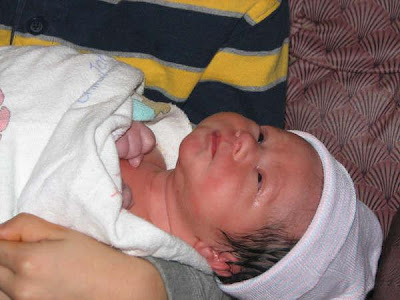 7) Going to Missouri the next day and spending a week with Curt's family, including Baby Cael. 8) Baby Girl's arrival in February! 1) That my hair would never be dirty and always look naturally fabulous. 2) That all the clothes laying around my room would fold or hang themselves up. 3) That the B's of Doom would stop being so doominous. 4) That my children will love Jesus more than anything else in the world. 5) For grace to get through these last two months of pregnancy without being the grinch who stole Mommy. 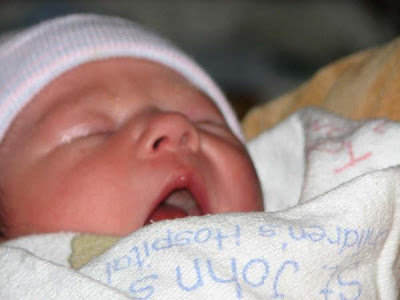 6) For an easy time getting back in the swing of nursing and being up at night. 7) For Baby Girl to be easy to please. 8) That I will get back in shape easily. Welcome to my home, old friends and new! 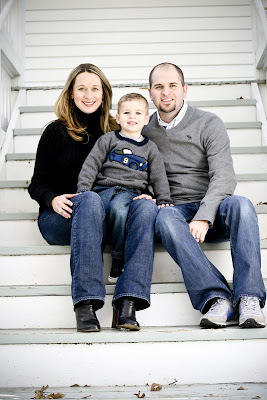 This is a very special Christmas for the Jones family because we are in a new home this year. When I first saw this house, which I could never have imagined living in in a million years, it was right after the holidays and the previous owner still had it decorated for Christmas. It was absolutely adorable. I'm sure I will never achieve her heights of cuteness as long as I live. But it's fun to see all of your old stuff on a new canvas, right? 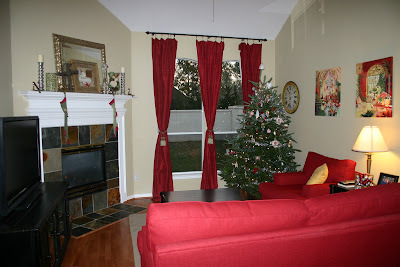 Here's my living room in Christmas mode. This fireplace, which is operated by remote control (can I get an amen? 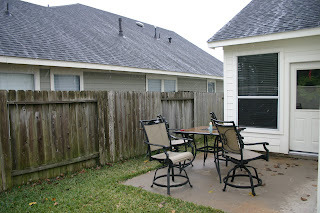 ), is probably what sold me on this home. 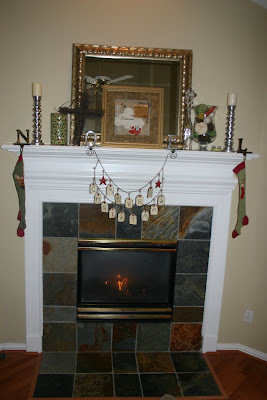 I love that I have a mantle for stockings and can actually light a fire at any time with no work whatsoever. This is nice in Houston because oftentimes you want a fire at 7 a.m. when it's 50 degrees, but not so much at 11 a.m. when it's back up to 75. You can see the fun stockings I bought for Curtis and myself the first year we were married. I think they came from Hallmark. Soon we will have some that match Jackson's and they will all go on the mantle together. My favorite thing on the mantle is the picture in the center. It was a wedding gift from Travis and Angela Cottrell and it has my favorite name of God on it - Redeemer. I got this from a co-worker a few years ago. I love it so much! Here is our lovely toddler-proof Christmas tree with all the breakable ornaments up top. 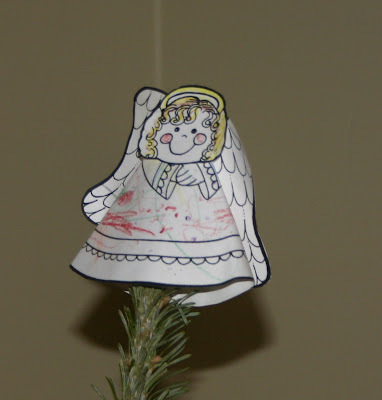 This is the tree topper Jackson made at MDO last year. If I weren't almost 8 months pregnant I might go get a real one for us. We'll see if I can give it up next year. 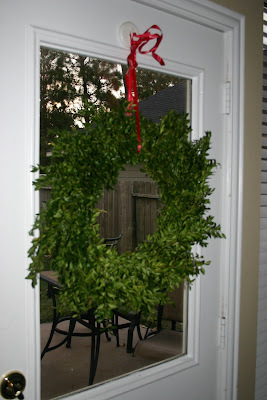 This is one of the two live wreaths that my husband let me get after I agreed that we could get a $35 Christmas tree. Score! I have been meaning to buy some nicer ribbon for it. Oh well, just keepin' it real, folks. 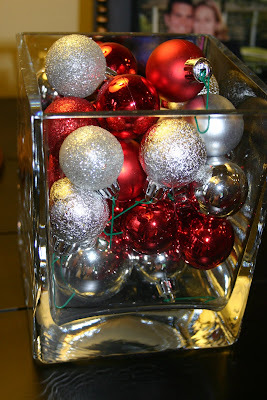 I found these shatterproof ornament balls at Target. 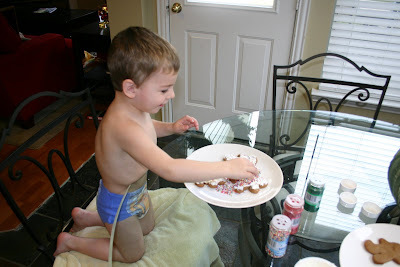 My toddler, Jackson, is exercising a ton of self control each day not to bounce bounce bounce! them around the house. 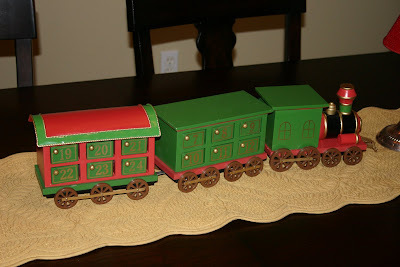 This is the little advent train that sits on our dining room table. This has been tons of fun every night. I meant to go all out in my dining room this year (seeing as how it's the first time I've had a dining room), but that will have to wait for next year's Christmas tour. 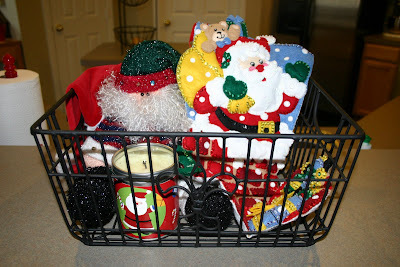 I put all my Santa things in this basket. (Don't worry, that candle never gets lit.) 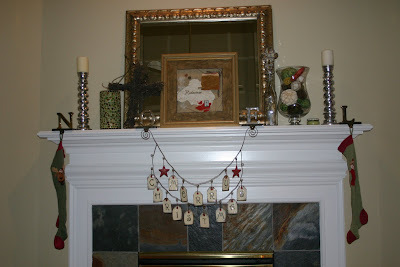 You can see Jackson's amazing stocking on the right, which was made by one of my sweet blog readers. Thank you, Cinde! Our Willow Tree nativity. I really need to buy the rest of the pieces. Can you tell I'm bad about putting things off? 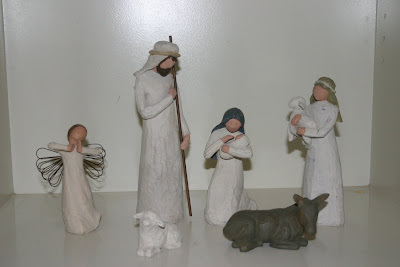 My Lladro nativity, given to me by my grandmother. Another nativity that my mom passed down to me. And that's the Baby Jesus my son made at Mother's Day Out. Well, what do you know! 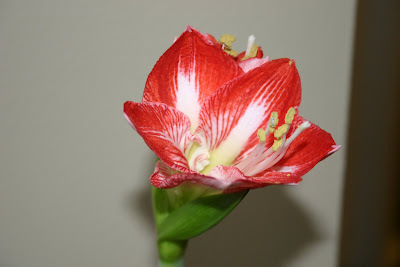 My amaryllis bloomed for you today! 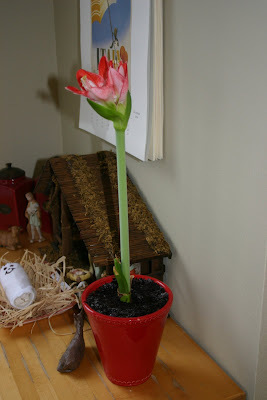 Jackson pointed at it this morning and said, "Mommy, the flower grow!" Thanks for stopping by today! Would you like a candy cane for the road? Merry Christmas to you from the Jones family! When Jackson takes his nap today I'll charge my camera battery (which seems to last about 10 minutes), clean my house, and take some pics for BooMama's Christmas Tour of Homes. The three of us ended up having a great weekend. On Saturday night Curtis overlooked his own hatred of Chinese food and let us go to Pei Wei. Yum. Then we went to the Carvel/Cinnabon store and indulged in some seriously fattening desserts. Jackson had some ice cream and Curtis and I both had cinnamon rolls. Mine even had pecans on it. Since I have no metabolism, I'm sure I gained five pounds overnight just from that one treat. It was really good though! Then we drove out to this neighborhood that is famous for its outrageous Christmas lights. Each street has its own theme. There are more Clark Griswold houses than you can count. Curtis and I have driven through there many times in the course of our relationship, but it was way more fun with Jackson. He loved it. The only thing that stunk was that it was hot outside. Again. But it is cold today. Houston weather is so bizarre. Church was great as usual. Afterward we got to hang out with some new friends of ours and their young boys. Little boys together are hilarious. They took the noise level in the restaurant up a few notches, as you can imagine. My child dropped a french fry on the floor and before I knew what he was doing, he climbed down on the ground to retrieve it and ate it. Awesome. We'd had my mom's car in our driveway all weekend, so last night we took it back to her house. She was not home from the airport yet, but was going to be soon, so we drove around until she got there. We headed to a nearby Sonic to get some juice for Jackson, who was losing his cool, and I remarked to Curt that the night felt so weird - like a ghost town. No one was out and about. True, it was a Sunday night, but it was still weird. Then we came up on the main highway through our part of town and there was a ton of commotion. It was a light parade! That's where everybody was! We parked close and sat on the hood of our Suburban while at least 10 firetrucks and tons of other vehicles decorated with Christmas lights paraded by. They were all doing their sirens and everything. Firetrucks are the current passion of my son's life, so you can imagine how exciting this was for him. We could not believe that we just stumbled upon this! Thank You, Lord! It was such a delight. Then Curt's battery died and a nice man jumped it for us. Mom got home soon and was exhausted, but she was sweet to let us barge in for a few minutes. I just missed her so much, I just had to see her! Of all things, she had strep throat last week and we didn't get to spend any time together. Yes, that was two days before Converge. Y'all would not believe all the crazy things that happened last week. We were up against A LOT but the Lord pulled it off. He's strong and mighty like that. I'm starting an organization called M.A.T.S.E.M.O.C.S. : Mothers Against the Shameless Emotional Manipulation of "Christmas Shoes." SHAME-LESS, people! If you haven't heard the song just google it. Also, I've hit a wall with Christmas music on my local Christian radio station. It's probably because for some reason I have no CD's in my car other than a Christmas one. Christmas music is all I have. I've tried the other stations but they play a billion obnoxious commercials and hardly any songs I know or like. I need some Crowder, some Tomlin, some Watermark, some Lakewood. Help. They were playing an ad for an upcoming Tomlin concert and I was seriously like halfway to heaven in worship just singing the short clips of all my favorite songs. I was that desperate. WHERE ARE ALL MY CD'S?!?! The Chronicles of Narnia is on right now and Aslan is about to commit to be sacrificed in Edmund's place. Edmund was a traitor and therefore he belonged to the White Witch and she was going to kill him. My favorite part is when Alsan roars and the witch is knocked back in her seat. It's a picture of John 18:6. This part - with Aslan the lion being humiliated and killed - is hard to watch but it reminds me of the power of Jesus Christ, who died on a cross in my place and then rose again. How can it be that my King would die for me? Not following me? Read this. 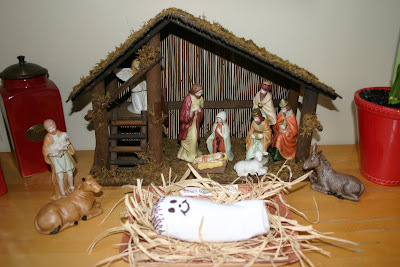 It's the whole reason we're so focused on this baby in a manger. Thanks so much for your prayers for Mel. I got to spend some time with her yesterday and she said it meant a lot that people are lifting them up. This girl is one of the most supportive, encouraging, real, loving people I know. She serves God and people in every single part of her life. She talks the talk and walks the walk. And she's just really great at friendship. I say all of that to tell you that you are blessing a truly wonderful person. I do not have an update today, but as of last night her mom was still on life support and they felt it would be a few days. Our friend Kristi is still very, very, very sick and fighting her cancer through chemo. After nine more weeks of chemo, they will assess whether it has had any effect on the cancer. Last week she lost her hair and had to get a wig, so her husband and her two oldest boys got their heads buzzed. That just tenders my heart so much. Some major prayer requests for them are strength, endurance, and relief from pain and chemo side effects for Kristi. Obviously strength, wisdom, peace, and comfort for their entire family. For God to help the children cope with what is happening. Loads and loads of grace to walk through the holidays. I found out that Kristi actually turns 30 next week. Thank you so much for praying for this amazing family. 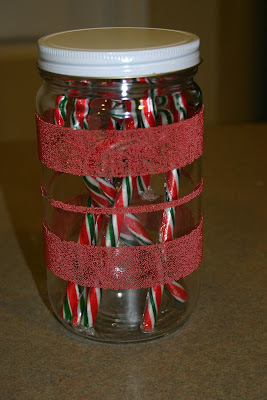 Today we had this really cool thing for kids at our church called Candy Cane Lane. It was like a Christmas-themed fall festival. The Altics were having a birthday party for Jayk there at the same time. So we got to partake of both! It was really fun. Then we came home and had naps. 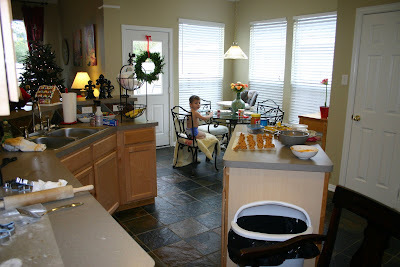 Curtis is edging the yard, Jackson is still asleep, and I am obviously blogging. I don't know what we will do tonight but I hope it involves fried okra or Chinese food. Probably not both since that would be gross. Checked in to the Houstonian hotel. Some cupcakes and Dublin Dr. Peppers were delivered to our room from the Altics. Sunday school Christmas party. Room service (strawberry-stuffed french toast). Shopping for and actually ordering Jackson's new furniture. Lunch and cookies at Paulie's. Massages at the Trellis spa. Mani-pedi thanks to a gift certificate from Kay for my birthday. Dinner at Freebird's. Non-cartoon movie. Church, which was only a five minute drive that day! Curtis spoke to the youth at a leadership training thing after church, so I went to lunch with Mom and Jackson. 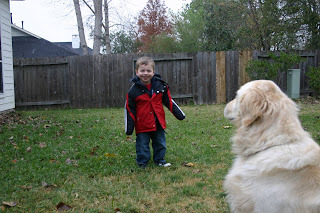 When we picked up Jackson from his class, he ran out and gave Bibby a huge hug and basically ignored me. Bless my heart. Then when we got out of the car at her house, he said, "Bye bye, Mommy!" It was really funny. I suppose that is a very good "problem" to have! Mom told me that as attached as I was to her at that age, I would throw an absolute fit when she had to pry me off my Nanny (her mom). So I guess I can live with this. :) Thanks, Mom, for making our fun weekend possible! Y'all, sometimes I forget to approve my comments. I always, always, always read and love every single one, but sometimes I forget to post them. Sorry about that. I just realized I had like 19 waiting in there. My bad. I have been looking forward to this day all week. It is December 12. Do you know what that means? Um, yeah, it's 12 more shopping days until Christmas, but that's not what I was looking for. Please don't remind Pregnant Girl that she needs to waddle through some malls at the pace of a snail while experiencing her many braxton hicks contractions and round ligament pains. No, I don't want to think about it. Curtis may have to take one for the team this year. What I was getting at is that I am TWO MONTHS OUT from my DUE DATE! Yeah! Today I am 31 weeks along. On one hand I can hardly believe it, and on the other hand it seems like forever ago that I was taking a pregnancy test on our San Antonio vacation. I have been planning to celebrate this day for the last week. But unfortunately I found out this morning that one of my BFF's, whom I lived with for 3 years in college, is losing her sweet mom. After a very tough five-year battle with ovarian cancer, she had an aneurysm last night and is on life support. My heart breaks for her. I just keep thinking that my friends and I are too young to be helping bury each other's parents. My roomie and her family know the Lord and I'm certain He is pouring out His grace and mercy and comfort on them. But this is hard. Loss at Christmastime? Hard. Thinking you are going on a cruise with your spouse on Saturday, but now being with her in ICU on Friday? Hard. The fact that they were going to be moving to another town to retire and live near their only child and their granddaughter in just two weeks? Hard. Mel told me this morning that this was the hardest thing she's ever done, but that God is giving her so much strength. He is faithful. But this is hard. Remember That Day When it Snowed? The Lord sent snow to Houston today! And we just had to play in it! In fact, I woke up Jackson from his nap to go outside. He was like, "Woman, have you lost your mind?" If God wanted to delight a bunch of kiddos and adults alike, He knew just how to do it. 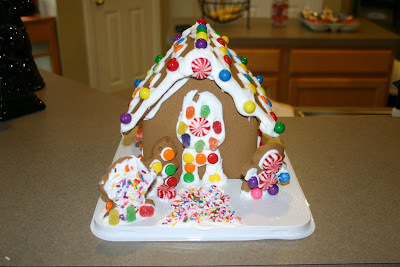 It's so funny because I was just writing on the LPM blog today about when it snowed on Christmas Eve in 2004. That may have been the last time, but I'm not sure since we spent the last few winters in D/FW. The weather has been insane for the last 24 hours. It was hot yesterday and then the front blew in with hurricane force wind late in the afternoon. I almost took Jackson into the bathroom because I was certain a tornado was headed our way. I guess that's not really surprising. By this morning it was in the 30's and seriously COLD. And wet. I joined my LPM sisters at the office for a birthday lunch today while Curtis took Jackson to the mall to get him a new jacket. Just in time, right? When we got home I could hear the freezing rain hitting the house. I thought about praying for snow, but honestly I felt so blessed that it was actually cold that I didn't go there. I just prayed that if it did snow, God would cause me to look up and see it. Sure enough, it wasn't long before I looked up and saw big ole flakes coming down in our backyard. What joy! I ran up the stairs and got Jackson out of his bed. He had literally just fallen asleep and was very confused. We threw on our jackets and shoes as fast as we could, not knowing how long the snow would last, and headed outside. 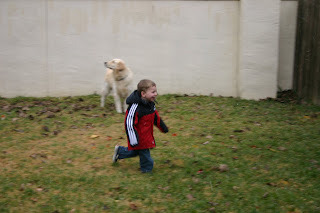 Once Jackson woke up a bit, he and Beckham ran all around the backyard together. Then we went out front and happened to see a school bus dropping off all the kids on the street. They were going crazy with excitement. A couple other moms came out with video cameras. Jackson ran around with the neighbor kids and had a blast. I have some cute pics but I don't feel good about posting them without permission. Anyway, it was an afternoon to remember. We came inside to the glow of the Christmas tree, the warmth of the fireplace already ablaze, and the provision of some peppermint hot chocolate mix in the pantry. Perfect! It was blissful. What a wonderful day from the Lord! We will probably all be sick tomorrow, but it was worth it! You can sort of see the flakes here if you enlarge it. 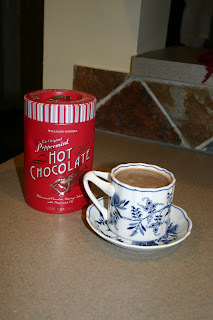 Williams Sonoma's peppermint hot chocolate mix. I've had this, unopened, for about 3 years. This is another reason we might be sick tomorrow. Hopefully not. It tasted great! Jackson's first hot chocolate. 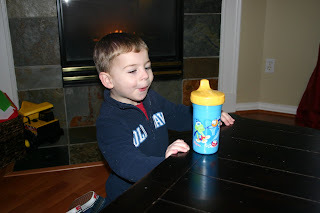 I'm sure I'm a bad mom for putting it in a sippy cup, but I didn't trust him with a mug. He didn't like it until it cooled off completely and was basically chocolate milk. PS - I had to laugh at myself for describing the flakes as "big" when I read my friend Kristy's version of today. She was a northerner until moving here in August and she described them as "the smallest flakes she'd ever seen." He he! Patty, whom many of you know from the Siesta Fiesta, needs prayer for healing and provision. You can catch up on her story here and here. 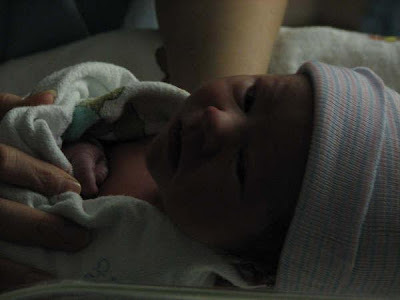 My sister in law, Lindsay, has a 5-day-old baby boy. He is precious! The stomach bug is going around their family, so please pray that God will stop it in its tracks. It would be so unpleasant dealing with that while having all the normal post-partum pains and issues. Awful. Please pray for mommy and baby to be protected. And a praise. I have been majorly stressing about finding a sitter for Converge on Thursday and the Lord provided today. Yeah! I cannot stop giggling about this. 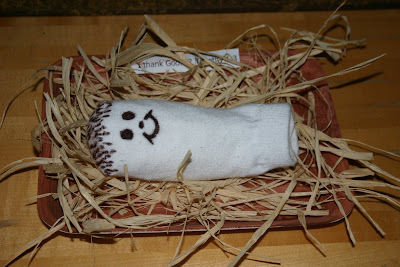 I never imagined that the sock Jackson's school asked for would become the Baby Jesus. So, last night we had the Jones Family Annual Christmas Tree Hunting Extravaganza. I have great memories of my family going to get our tree growing up, so I like to do it up right. 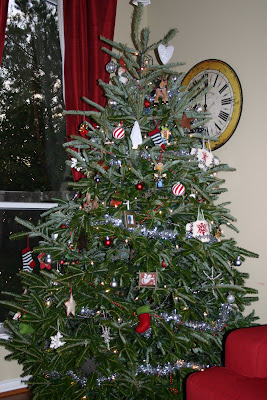 The Moore family highly prized a good tree and we always got the biggest, fullest one we could fit in our living room. So that is what I carry in my heart when we go to find our Jones Family Tree. Every year Curt threatens to get us a fake tree. One year we got a nice pre-lit tree but Beckham was a puppy and he ate (chewed and swallowed) the light clusters off the bottom two feet of the tree. That one goes on our porch now. I'm actually allergic to pine, so I'm always slightly tempted to give in to this sacrilege, but when it comes down to it we get a real tree. They're just so much more festive! Okay, so I thought last night would be so fun. The last two years with Jackson have really been neat and now he's older and understands more. I always take my camera to document the process. Well, we had a boy who hadn't napped, a camera battery that died before one picture could be taken, and two parents who were at odds about the price range of tree we should be looking at. The garden center we were at advertised "Most trees $35," so this became Curt's expectation. Well, the first tree I pointed out to my husband ended up having $189 on the price tag. Once I knew that, of course I didn't ask for that tree, but maybe that will illustrate the difference in our taste. That was not a good way to start off because it put us both on the defensive. So I submitted to my husband and the $35 tree. It was hard, y'all. I really like a grand tree. But I was highly aware that the Spirit of Christmas was not being displayed in my person. I put a smile on my face and said, "I love it!" I'm not sure how believable I was. But one thing I know is that God blesses me when I submit to my husband. If He wanted to, He could give me the grace to believe it was the most beautiful tree that has ever graced any home and He could even take away its ability to make my nose run. On the other hand, if I fought for the one I really wanted and got it, he could make all the needles fall off by next week and it might have some kind of termite living in it that would infest my house. YOU JUST NEVER KNOW. Or maybe the blessing would just be that I wouldn't be in a fight with Curtis. Which is a very valuable thing in itself. 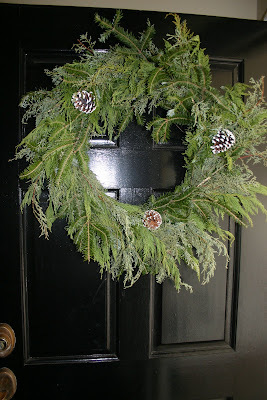 Hubs did very cheerfully let me buy two live wreaths when we were checking out, so that was a bonus. Incidentally, together they cost more than the tree. So the Jones Family Tree of 2008 is up and decorated in our living room. Of course, its placement took some compromise and working together. The couches have been rearranged and everything. But it looks great and Curtis and I are still in love. Jackson did not get to decorate it with us due to his extremely sour mood and having to go to bed early, but his expression this morning when he first saw it was priceless. 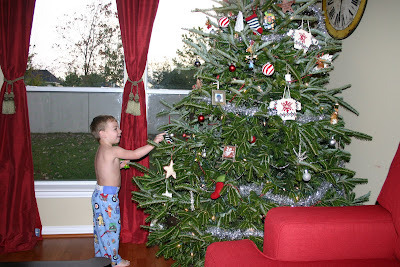 Here are some pics of Jackson investigating the tree. 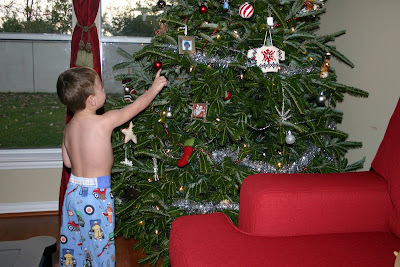 He was immediately drawn to the little red and silver ball ornaments that I just bought. They're not breakable, but don't tell him that. He's not allowed to play with them and it's killing him. He keeps telling me how he wants to bounce, bounce, bounce! them. The tree is prettier in person, but I think that's true of every photographed Christmas tree. I apologize for most of the ornaments being clustered at the top. That is of course because of the boy. Also, check out the old school tinsel that Curt requested this year. 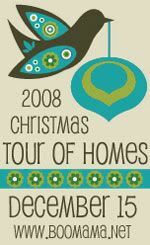 Well, I'm saving the rest of our pics for BooMama's Christmas Tour of Homes! Gotta run. Time to get ready for our Babymoon/Mega-Date Weekend! PS - Jackson told me his head boo-boo was itching this morning, so I took a look at it. I hadn't seen it in a while since you really have to dig through his thick hair and he puts up a fight. But today I saw it...and I almost threw up in his hair. It was so disgusting! Little boys and their scabs! Ugh! 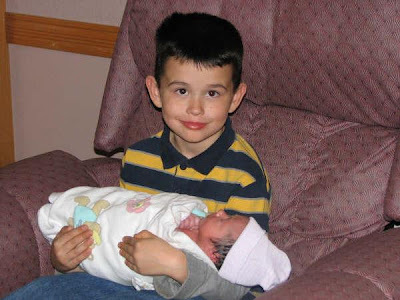 Born December 3, 2008, at 8 p.m. to Matt and Lindsay Wallace and proud big brother Gavin. Six pounds and 14 ounces of sweet baby boy!